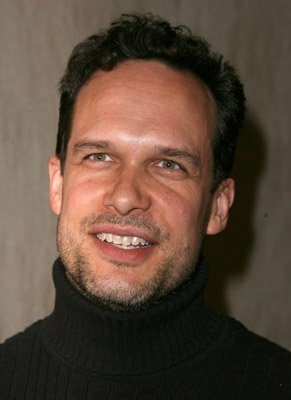 Having a deep and easily-recognizable voice, Karl Diedrich Bader (born December 24, 1966) is a natural choice for a voice actor and has had roles in such animated features as Ice Age, The Simpsons, Buzz Lightyear of Star Command, The Grim Adventures of Billy & Mandy and The Penguins of Madagascar. He appeared in the 1999 film Office Space as Peter's mulleted neighbor Lawrence, My-ik in 2002's Evil Alien Conquerors, and in the 2004 film Napoleon Dynamite as Rex, the owner of a martial arts dojo. He was also in the 2004 film Eurotrip as a thief. All of these roles had Bader altering his appearance in some way so as to be less recognizable (except EAC, which is weird, considering he plays an alien). He appeared in an episode of 7th Heaven as the character portrayed by Colton James, T-Bone's father in 2007. He also recently appeared on the TV legal drama Shark, surprisingly in the same episode as his former on-screen wife from The Fresh Prince of Bel-Air, Charlayne Woodard, who played Janice Smith in the 90's sitcom. He also appeared in the episode of Curb Your Enthusiasm titled "The TiVo Guy." His most famous non-voice roles, however, are as Drew Carey's Cloud Cuckoo Lander friend Oswald Lee Harvey on The Drew Carey Show and as Jethro Bodine in the remake film of The Beverly Hillbillies. He also provides the voice for the title character of Korgoth of Barbaria. Bader has the honor of lending his voice to four different Batman cartoons as both heroes and villains: Batman Beyond, The Zeta Project, The Batman (TV series), and Batman: The Brave and the Bold. In the last one he voices Batman himself. Zeta in The Zeta Project and the Batman Beyond episode "Countdown"
Incidental characters on Be Cool, Scooby-Doo! Badass Baritone: He has a very deep voice, and who's more badass than The Goddamn Batman? Large Ham: Especially in Napoleon Dynamite. The Other Darrin: He is often brought in to voice characters previously voiced by Will Arnett.